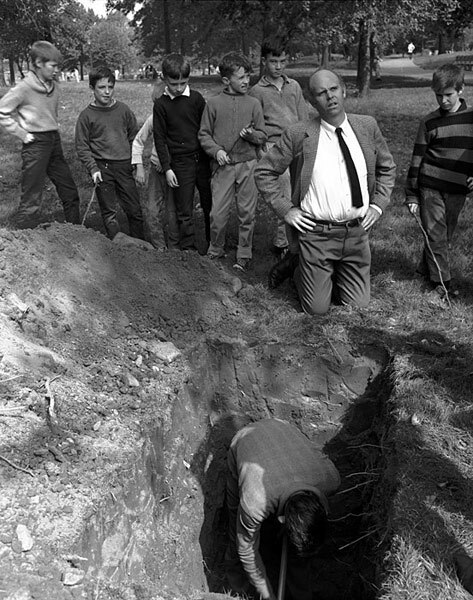 Keith Arnatt, Liverpool Beach Burial, 1968, gelatin-silver print, 10 1/4 × 7 1/16 in. (26 × 18 cm), courtesy of the Keith Arnatt Estate and Maureen Paley, London. Beginning in the spring of 1969, John Baldessari and George Nicolaidis set out to overlay the California landscape with symbols commonly found on the state map. For the first part of the project, using a combination of found objects and materials they brought with them, the artists formed each of the letters that make up the word “California” at corresponding locations in the physical landscape, starting in Southern California with the last “A,” For the second part of the project, Baldessari fabricated a red star like that used on maps to indicate the state capital, placing it on the lawn of the capitol building in Sacramento. For the final work in the project, Baldessari and Nicolaidis rendered the broken segment of the map’s boundary line between the United States and Mexico in the landscape using colored pigment powder. 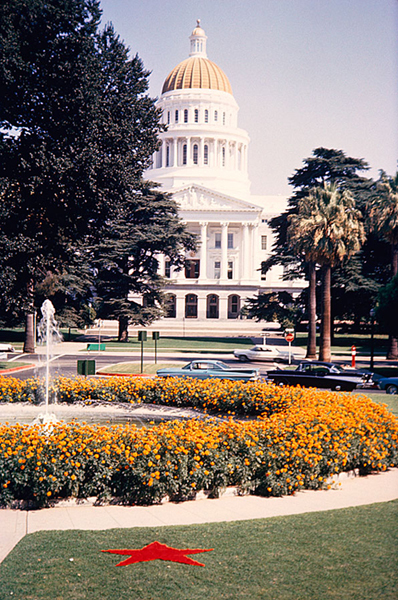 John Baldessari, California Map Project, Part II: State Capitol, 1969, color photograph on archival paper, 12 1/16 × 8 1/16 in. (30.64 × 20.48 cm), collection of Lawrence & Alice Weiner, New York. Robert Barry, Inert Gas Series, 1969; Helium (2 Cubic Feet), 1969, gelatin-silver print,, 19 5/16 × 25 9/16 in. (49 × 65 cm), Collection of Paul Maenz, Berlin. In Earth Mound, made for the Aspen Institute for Humanistic Studies, a 42-foot-diameter berm encircles a grassy area containing a small hill; a round, shallow depression; and a tall, crudely cut white rock. A small opening in the ridge allows visitors to enter and explore the space. Bayer, who first studied and then taught at the Bauhaus, designed the Aspen Institute’s extensive grounds to bring its built environment into harmony with the surrounding nature. 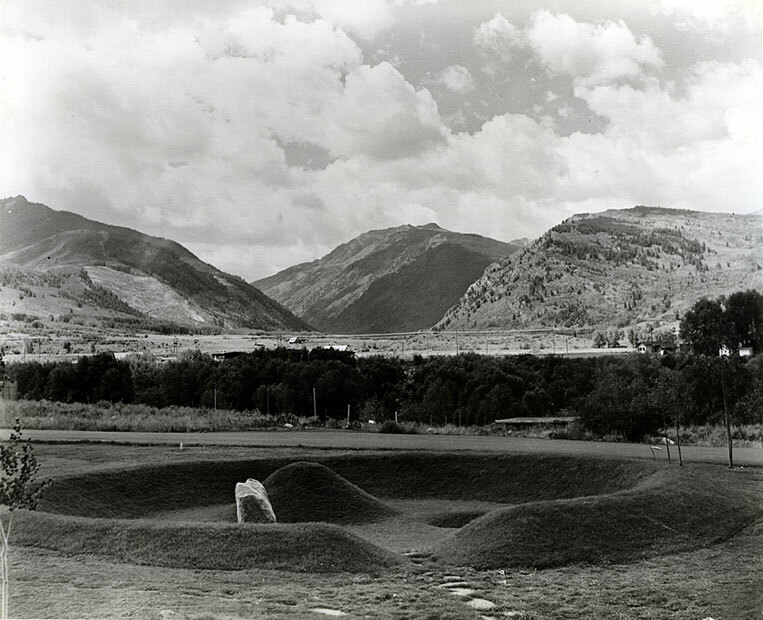 A photograph of Earth Mound was included in Virginia Dwan’s 1968 “Earthworks” exhibition, and the work influenced numerous artists working in the landscape in the United States in the 1960s. Herbert Bayer, Earth Mound, 1955, two gelatin-silver prints, 26 × 30 in. (66.04 × 76.2 cm) and 25 × 30 in. (63.5 ×76.2 cm), Virginia Dwan Collection. 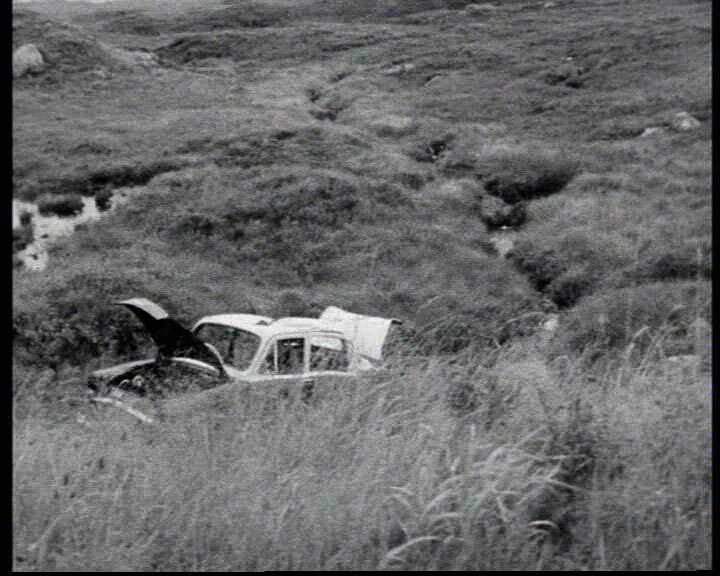 Kinloch-Rannoch was filmed in mid-August 1970 during a trip to Rannoch Moor, an isolated, boggy moorland in Scotland that Beuys once described as “the last European wilderness.” The film was shot by Mark Littlewood with the assistance of Rory McEwen. As the camera pans slowly across the rocky landscape, Beuys’s hand appears intermittently in the foreground, shaping and then tossing a lump of fat into the air. Gallerist Richard Demarco accompanied Beuys, whom he had invited to participate in “Strategy: Get Arts,” an exhibition of contemporary German art held during the Edinburgh Festival at the College of Art during August and September 1970. Oneof Beuys’s contributions to the festival was Celtic (Kinloch-Rannoch) Scottish Symphony, a four-hour-long action performed twice daily from August 26 to 30 with Dutch composer Henning Christiansen. Kinloch-Rannoch was projected on the back wall during the last half of Celtic. Joseph Beuys, Kinloch-Rannoch, 1970, 35mm film; black-and-white and silent, 35 minutes, nationalgalerie im Hamburger Bahnhof, Museum für Gegenwart, Berlin. The Boyle Family is an artist collective comprising Mark Boyle and Joan Hills and their children Sebastian and Georgia. 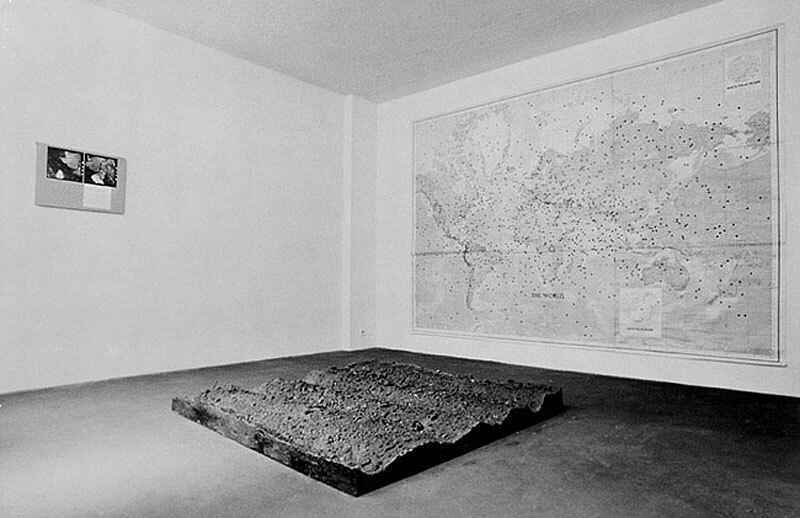 This work, first shown in 1971 at Galerie Paul Maenz in Cologne, consists of a large world map and a square fiberglass floor sculpture indexing a 6-by-6-foot area of the earth’s surface in Nyord, Denmark. The work is part of the Boyle Family’s larger World Series Study (1968–69), which mapped more than 1,000 locations randomly selected by blind-folded participants throwing darts at the map. 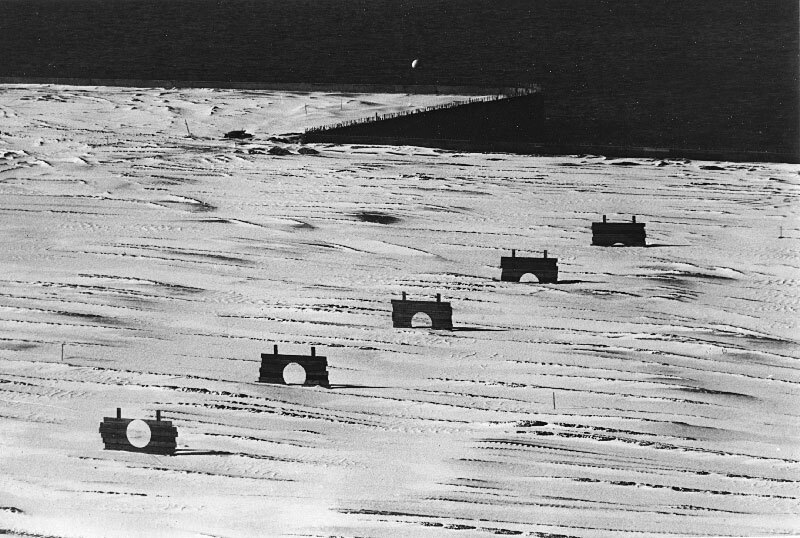 The series entails recording and making permanent the existing conditions of a particular site by creating molds from sections of land, and the artists devised extensive procedures to deal with a variety of site conditions such as snow, water, or ice. The largest single artwork ever made, Wrapped Coast was mounted in Little Bay, Sydney, Australia, on October 28, 1969, and remained on view for ten weeks. Christo and Jeanne-Claude, with the assistance of 125 students, teachers, professional climbers, and workers and under the supervision of Major Ninian Melville, retired from the Army Corps of Engineers, wrapped approximately one and a half miles of coast, including cliffs up to 85 feet high, using synthetic fabric and rope. This was the first work in the series of Kaldor Public Art Projects initiated by Australian collector John Kaldor. The project was financed by the sale of Christo’s preparatory drawings, collages, models, and lithographs. In the end, all materials used were removed from the bay and recycled. ABC Australia filmed a documentary of the project. 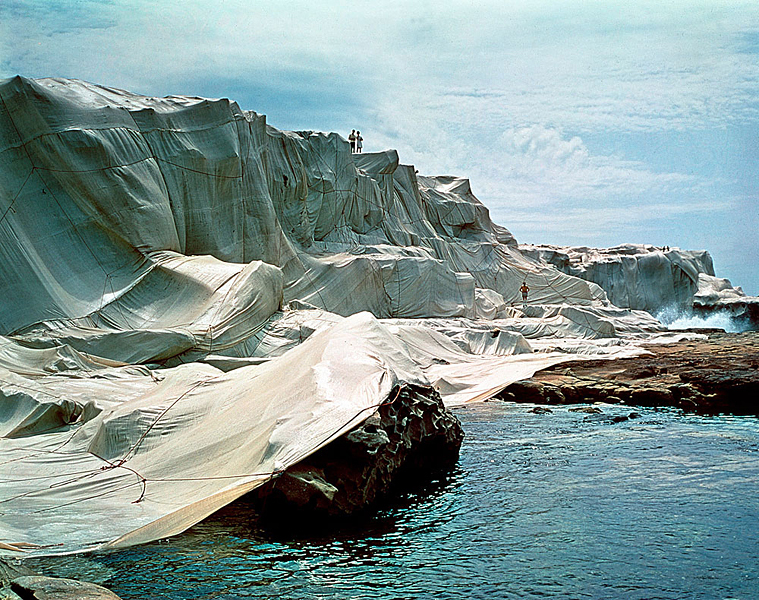 Christo and Jeanne-Claude, Wrapped Coast—One Million Square Feet, 1968–69, photograph dimensions variable, collection of Christo. 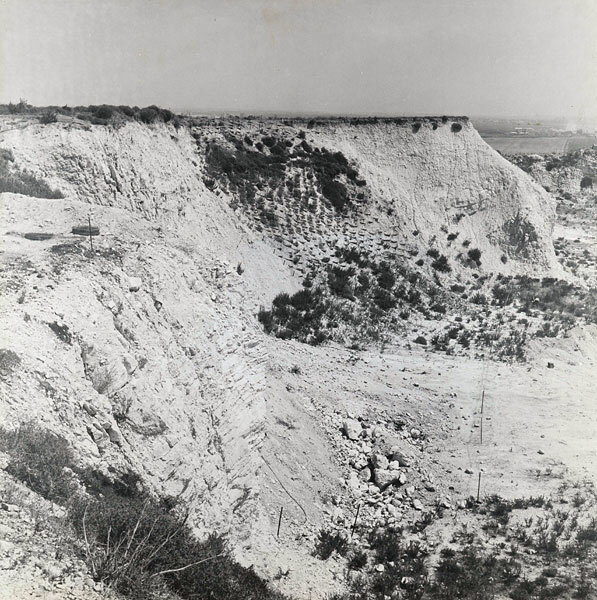 From February to November of 1971 Danziger worked with ecologist Zeev Naveh and soil and erosion expert Yosef Morin to “rehabilitate” Nesher Quarry, an abandoned mine located near Haifa in northern Israel. The project was an interdisciplinary experiment whose goal was to reintegrate the quarry area with its surroundings ecologically and topographically; in doing so, the team also sought to develop methods that would allow for other quarries to be rehabilitated in the future. In this selection of ink drawings and collage on paper, Danziger both abstractly represents and reconfigures the landscape of the exhausted quarry. Yitzhak Danziger, The Rehabilitation of Nesher Quarry, 1971, gelatin-silver print, 27 9/16 × 27 9/16 in. (70 × 70 cm), The Israel Museum, Jerusalem. This is one of two outdoor interventions executed by Dibbets for the 1969 “Earth Art” exhibition at Cornell University in Ithaca, New York. The work was located near Six Mile Creek, several miles from the Andrew Dickson White Museum of Art, where the exhibition was held. Dibbets marked a large V shape in the terrain, overlapping a forest path, with each arm of the V measuring approximately 5 feet wide and 100 feet long. The earth within the V shape was then tilled with pickaxes and shovels, with the section where the V intersected the path left untouched. Dibbets considered both the walk to the site and the five black-and-white photographs of the site shown in the “Earth Art” exhibition to be part of the work. This film was inspired by the 1957 book Cosmic View by Kees Boeke as well as by architect Eliel Saarinen's statements about scale. It opens with an overhead shot of a man and a woman lyingon a picnic blanket in a park in Chicago. In an effort to depict the scale of the couple, the planet Earth, and the galaxy relative to one another and to that of the universe, the camera zooms out at a distance of a factor of ten every two seconds, until the galaxy is seen as merely a speckof light among many others. The camera then zooms back in, with ten times the magnification every ten seconds, focusing in the end on the proton of an atom. 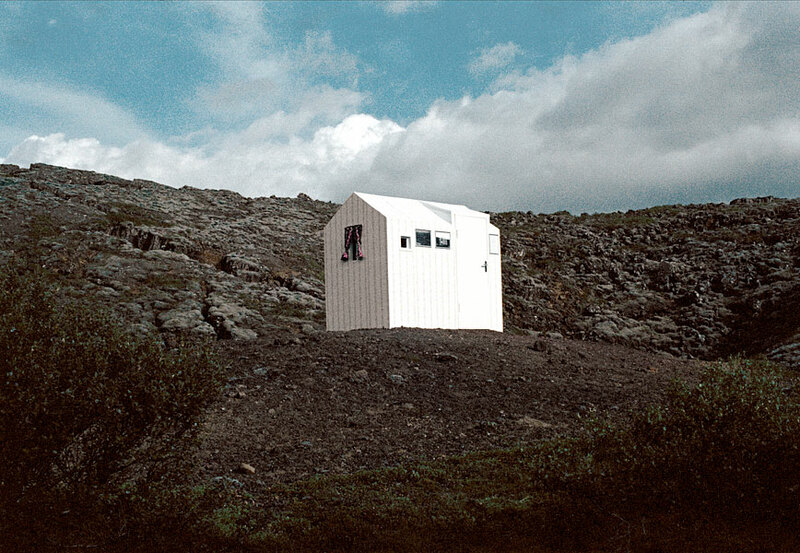 Hreinn Fridfinnsson, House Project, 1974, sixteen color photographs and two texts, photographs: 7 7/8 × 11 7/16 in. (20 × 29 cm) each; texts: 11 5/8 × 8 1/4 in. (29.5 × 21 cm) each, Moderna Museet, Stockholm. Created for the exhibition “Arte de Sistemas,” organized by Jorge Glusberg for the Centro de Arte y Comunicación, Buenos Aires, Tierra consisted of two large placards hung on a fence that enclosed a vacant lot across the street from the museum. The placards invited viewers to enter the museum, which was located on the ninth floor of a municipal building, to discover a “hidden aesthetic experience” that could only be had from that vantage point, and not from the street. 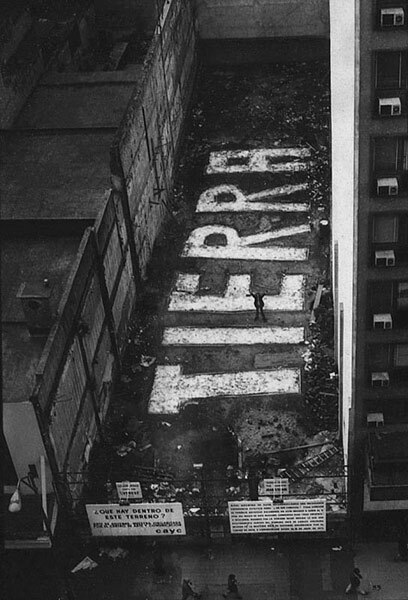 The building’s two elevators were covered with signs that also encouraged viewers to discover the “hidden work.” At the entrance on the ninth floor, arrows and text led visitors to one of the windows, from which they were able to see the word tierra painted on the ground of the vacant lot in large white letters. Carlos Ginzburg, Tierra, 1971, gelatin-silver print, 9 7/16 × 7 1/16 in. (24 × 18 cm) each, courtesy of the artist and Henrique Faria Fine Art, New York. In their June 1965 manifesto, the nine original members of Group “i,” based in the Kobe region of Japan, stated: “Our name ‘i’ is the ‘i’ of tan’i [unit], ‘i’ of ichi [position], ‘i’ of iso [phase]. That is to say, we loosely mean each one of us is a unit within the multitude, and is positioned within it.” Both the group’s name and their activities stressed the importance of collective action and anonymity, common concerns among Japanese artists during the 1960s and 70s. 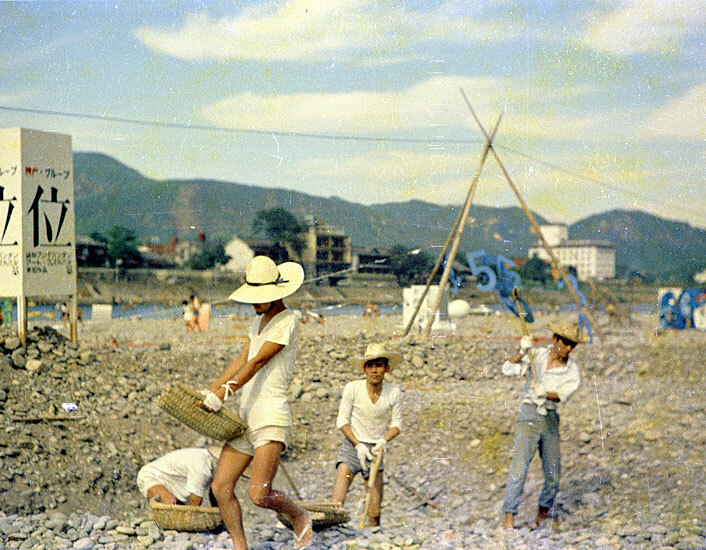 Hole was created for the Gifu Independent Art Festival, August 9–19, 1965, on the banks of the Nagara River in Gifu, Japan. After eight consecutive days of collective digging, the group had created a hole approximately 32 feet in diameter and approximately 5 feet deep. At the end of the festival, in accordance with city regulations, the hole was filled back up. 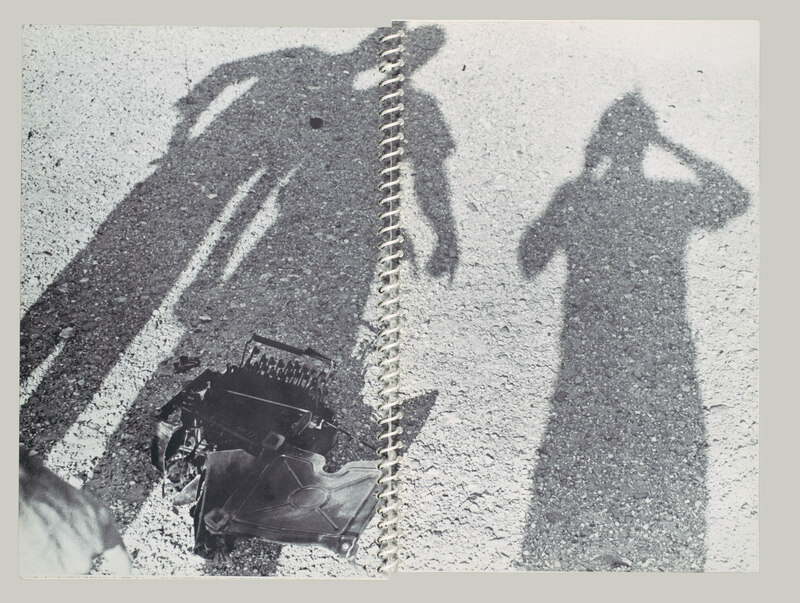 Group "I", Hole, 1965, gelatin-silver print and postcard, dimensions variable, collection of Group “I”. Huebler made this work in October 1968 for a one-day site-sculpture project. Drawing a hexagon on a map of Putney, Vermont, the artist traveled to the locations marked by the shape’s points. In addition to the map, the work comprises photographs and dirt samples from each of the five locations. 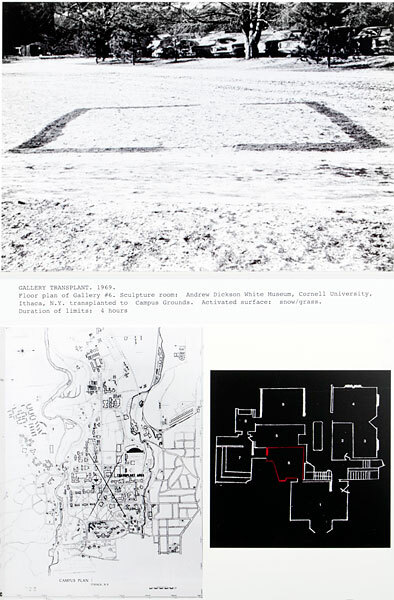 Douglas Huebler, Site Sculpture Project, Windham Collllege Pentagon, Putney, Vermont, 1968, maps, photographs, typescript, and printed text on board, 24 1/2 × 50 1/4 in. (62.2 × 127.6 cm), Tate: Presented by Mr. and Mrs. Joshua A. Gollin through the American Federation of Arts, 1973. This film was recorded with a static camera over the course of one day at a ranch near Carbondale, Colorado. Working against the tendency to view natural landscapes as sublime, picturesque, or spectacular, Hutchinson presents a mundane site suited only for cultivation. The slow changes in the weather and the shifts in sunlight as time passes become the “drama” of the film. Peter Hutchinson, A Day in the Life of Mt. 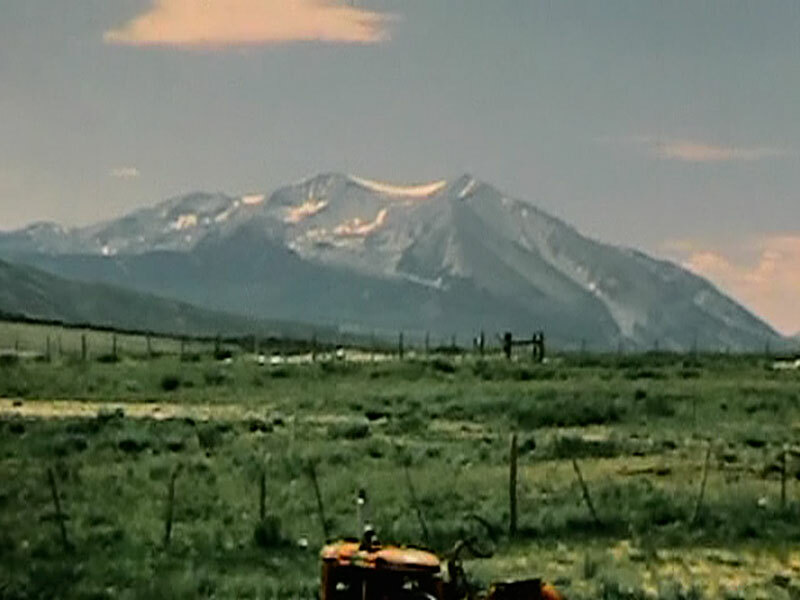 Sopris, 1972, 16mm film transferred to DVD; color and silent, 19:52 minutes, collection of the artist. 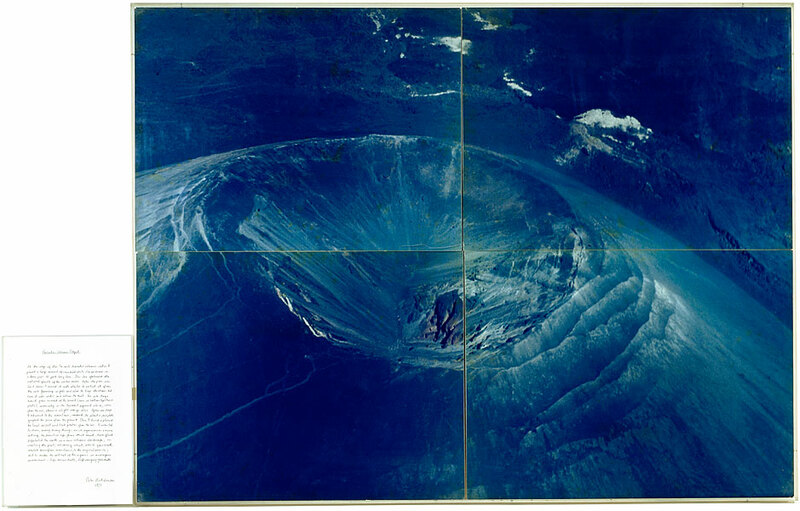 The Paricutin Project was first shown in 1969 at John Gibson Gallery in New York as a model illustrating Hutchinson’s conception of an action to take place on Mt. Paricutin, a volcanoin Michoacán, Mexico. A year later, Time magazine funded Hutchinson’s trip to the site to make the work in exchange for exclusive rights to publish the photographs. In an attempt to produce life in a place generally thought of as lifeless, the artist laid 450 pounds of bread crumbs in a line approximately 250 feet long around the rim of the volcano. Mold appeared after six days, in part because of the heat and steam rising from the earth. Two photographs of the project were published in the June 29, 1970, issue of Time. Later that same year, large-scale photographs of the work, along with text describing the trip, were shown at John Gibson Gallery. Peter Hutchinson, Paricutin Volcano Project, 1970, four color photographs mounted on cardboard and framed with acrylic glass; and India ink text on cardboard framed with acrylic glass, 59 7/16 × 78 3/4 in. (151 × 200 cm) and 20 1/2 × 15 3/8 in. (52 × 39 cm), courtesy of Galerie Bugdahn und Kaimer, Düsseldorf. Interested in the physical limitations of sight and in measuring how far the eye can see, Johanson created this 1,600-foot-long by 2-foot-wide sculpture made of plywood planks painted with yellow, red, and blue bands. 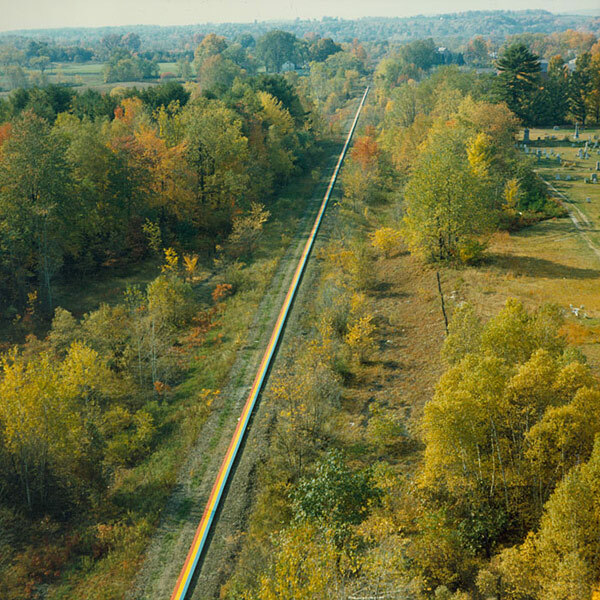 Sited on a portion of the defunct Boston & Maine Railroad tracks from Buskirk, New York, to Bennington, Vermont, the work is named after Stephen Long, a military officer who became a railroad surveyor and engineer. Both the location of the work and its title emphasize the impact of rail transportation on modern perceptions and experience of the landscape. The work gained considerable local media attention, and John Lindsay, Mayor of New York, invited Johanson to permanently install the piece in the mall at Central Park. As the available space was only 1,300 feet long, the artist, unwilling to alter the work’s length, declined the invitation. Patricia Johanson, Stephen Long, 1968, 16mm film transferred to DVD; color and sound; CBSTV, 1968; edited by Joanna Alexander, WNET-TV, New York, 1971, 5 minutes, courtesy of the artist. Silbury Hill is the largest prehistoric man-made hill in England. 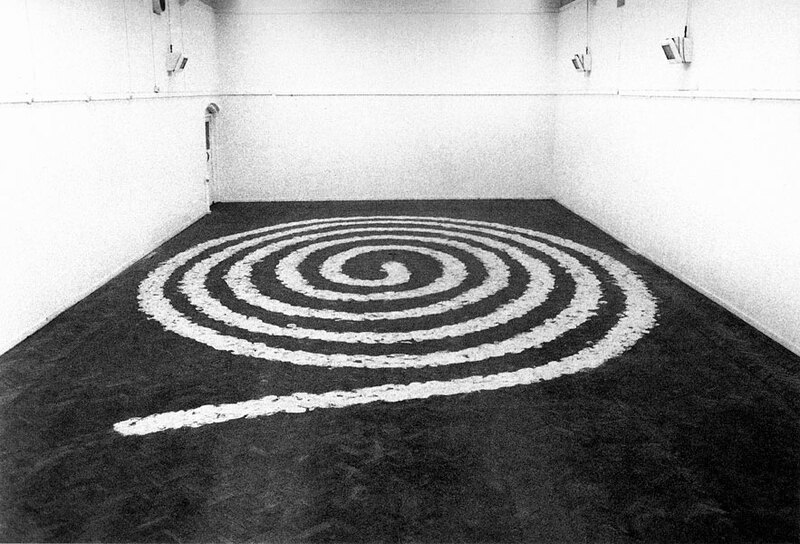 In A Line the Same Length Long’s footprints, cast in clay, form a spiral on the gallery floor that is equivalent to the number of steps necessary to move from the base of the mound to its peak in a straight ascent. This work was first presented in a solo exhibition at Virginia Dwan Gallery, New York, in 1970. Richard Long, A Line the Same Length as a Straight Walk from the Bottom to the Top of Silbury Hill, 1970/2012, natural white china clay, dimensions variable, collection of the artist, courtesy Haunch of Venison, London. A founding member of Group Zero—an artist collective established in Düsseldorf in 1958—Mack drafted the final version of his manifesto for Sahara Project in 1959. It was first published in Zero magazine in 1961, and subsequently republished and translated from German into French, Dutch, and English in 1967 for Mackazin, the artist’s journal-catalogue. 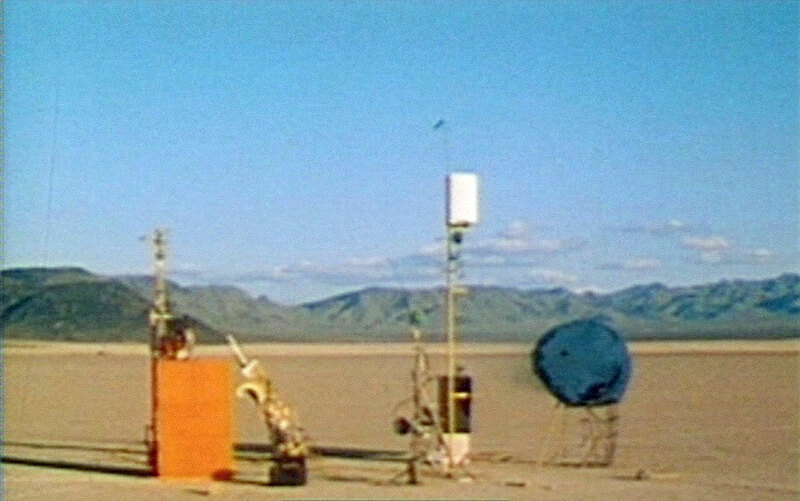 Sahara Project, made in homage to Yves Klein, proposes placing large-scale sculptural works in remote areas of the world’s deserts, like mirages to be encountered by anyone coming upon them. One such location was the Sahara Desert, which was the main testing site for French nuclear weaponry after 1958. 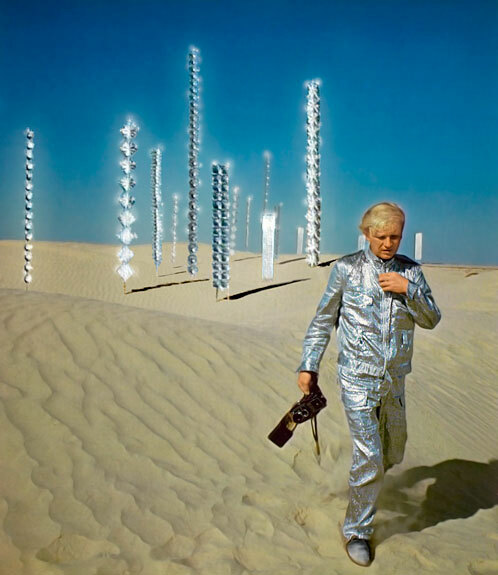 In 1967 Mack went on an expedition to the Sahara with the German public television station Westdeutscher Rundfunk (WDR), which led to two televised presentations of the project the following year—one for WDR and the other for Saarländischer Rundfunk. The popular weekly German magazine Stern presented the project in a feature spread in 1977. Heinz Mack, Tele-Mack, 1968, 16mm film transferred to DVD; color and sound, 24:35 minutes, production of Saarländischer Rundfunk, author Prof. Heinz Mack, courtesy of Kunst- und Ausstellungshalle der Bundesrepublik Deutschland GmbH. 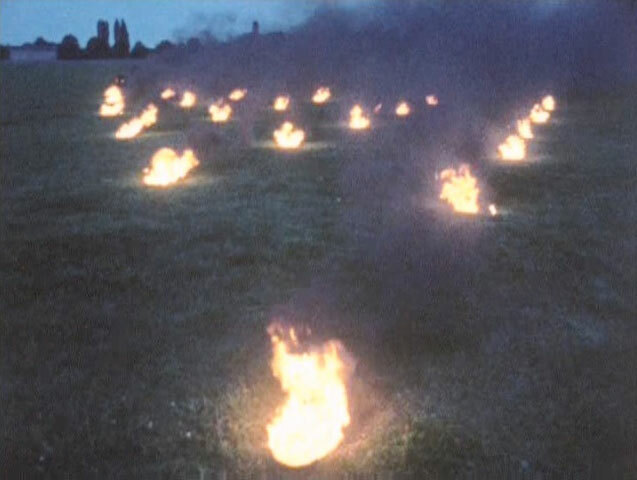 Anthony McCall, Landscape for Fire, 1972, 16mm film transferred to DVD; color and optical sound, 6:55 minutes, courtesy of the artist and Sean Kelly Gallery, New York. This temporary installation on the Battery Park Landfill (now Battery Park City) comprised five wood billboardlike structures placed in a row at 50-foot intervals. Each billboard had a circle or segment of a circle cut out of it; walking the length of the work, it appeared as if the shape was disappearing into the ground. The installation on the one hand recalled time-lapse photographs showing the setting of the sun or moon. On the other hand, when looking straight through the cutout shapes, it gave the appearance of a tunnel receding into the horizon. 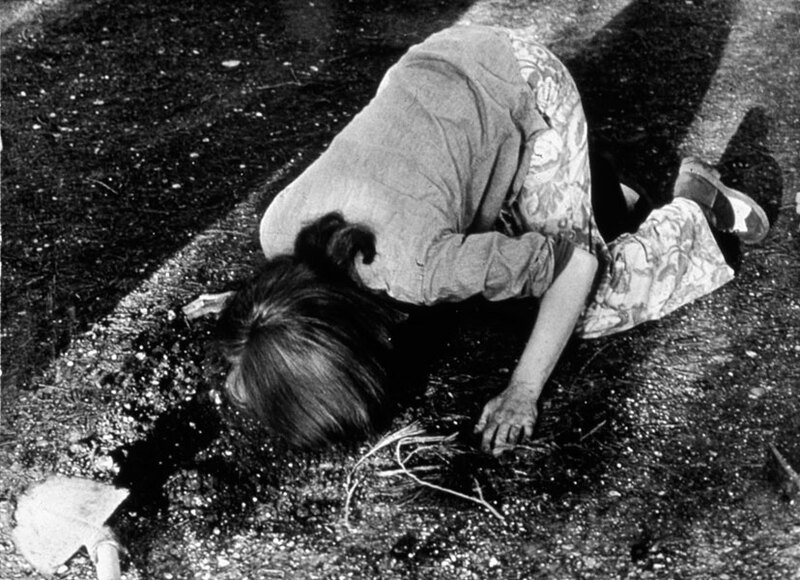 Mary Miss, Battery Park Landfill, 1973, three gelatin-silver prints mounted on foam board, one print: 22 × 30 in. (55.88 × 76.2 cm); two prints: 10 × 8 in. (25.4 × 20.32 cm) each, courtesy of the artist. The Hole is a film made in conjunction with Oldenburg’s Placid Civic Monument, which he produced for “Sculpture in Environment,” an outdoor exhibition sponsored by the New York City Administration of Recreation and Cultural Affairs. On October 1, 1967, gravediggers hired by the artist worked from 10:30 a.m. until 12:30 p.m. to create a 6-foot-wide by 3-foot-deep hole in Central Park behind the Metropolitan Museum of Art. After a lunch break, Placid Civic Monument was refilled and smoothed over. The Hole, which details the making of the work, was first shown in the “Earthworks” exhibition at Virginia Dwan Gallery in New York in 1968. Claes Oldenburg, the Hole, 1967, super-8mm film; color and silent, 9:45 minutes, Whitney Museum of American Art, New York, gift of Claes Oldenburg. In addition to his outdoor work Beebe Lake Ice Cut, the making of which was assisted by Cornell University students Gordon Matta-Clark and Louise Lawler, Oppenheim produced Gallery Transplants as his indoor contribution to the university’s 1969 “Earth Art” exhibition. Working out a system to articulate links between indoor and outdoor spaces, the artist mapped the floor plan of the gallery spaces at the Andrew Dickson White Museum of Art onto various locations across the snowy university campus, marking the lines that represented the gallery’s walls, at full scale, by walking in the snow. Oppenheim developed a display format for the series that incorporates photographs, maps, and plans, which he went on to use in other Gallery Transplant projects. Dennis Oppenheim, Gallery Transplant, 1969, gelatin-silver prints and hand-marked floor plan, floor plan of Gallery #6, sculpture room: Andrew Dickson White Museum of Art, Cornell University, Ithaca, N.Y., transplanted to campus grounds activated surface: snow/grass, Duration of limits: 4 hours, 60 × 40 in. (152.4 × 101.6 cm), estate of Dennis Oppenheim, New York. Parallel Grid Proposal for Dugway Proving Grounds is Piper’s response to a United States Army test on March 13, 1968, of VX nerve gas at Dugway Proving Ground, the test site in the Utah desert ninety miles outside of Salt Lake City. During this test, some of the gas was accidentally released too high in the atmosphere, reportedly killing 6,400 sheep on nearby ranches within days. The army publicly denied responsibility for the deaths, but a secret admission was leaked to the press, leading local politicians and state agricultural and public health officials to demand further investigation. Piper’s proposed solution for engaging the local community in the activities at the Proving Ground was to build a large Minimalist structure above the town of Dugway, where many members of the Proving Ground staff lived. The structure would have comprised a grid of tall, vertical steel beams connected by lengths of telephone cable. As the shadow cast by the structure moved across Dugway each day, residents in its path would receive messages via phone loudspeaker, and electronic billboards would keep them informed of activities at the test site. 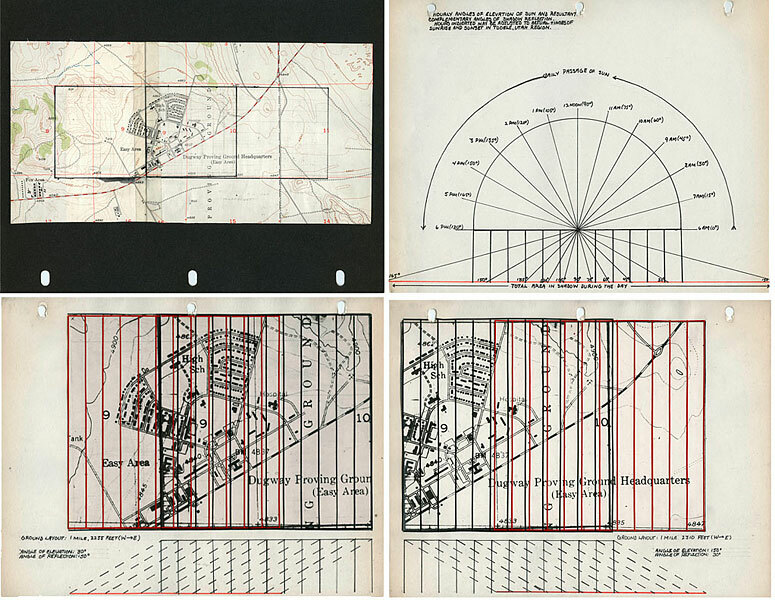 Adrian Piper, excerpts from Parallel Grid Proposal for Dugway Proving Grounds, 1968, thirty pages, vintage original and Photostat maps, acetate page protectors overdrawn with red architectural tape, India ink diagrams, and typescript texts on bond paper, 8 1/2 × 11 in. (21.59 × 27.94 cm) or 11 × 8 1/2 in. (27.94 × 21.59 cm) each, collection of Beth Rudin DeWoody, New York. Beginning in the late 1960s, Saglova was one of the first artists to work in the landscape outside Prague, carrying out actions with her friends, many of whom were part of the artistic underground in then-Communist Czechoslovakia. For Homage to Gustav Obermann, Saglova arranged twenty-one plastic bags filled with jute and gasoline in Bransoudov (near Humpolec) in a circle during a snowstorm. 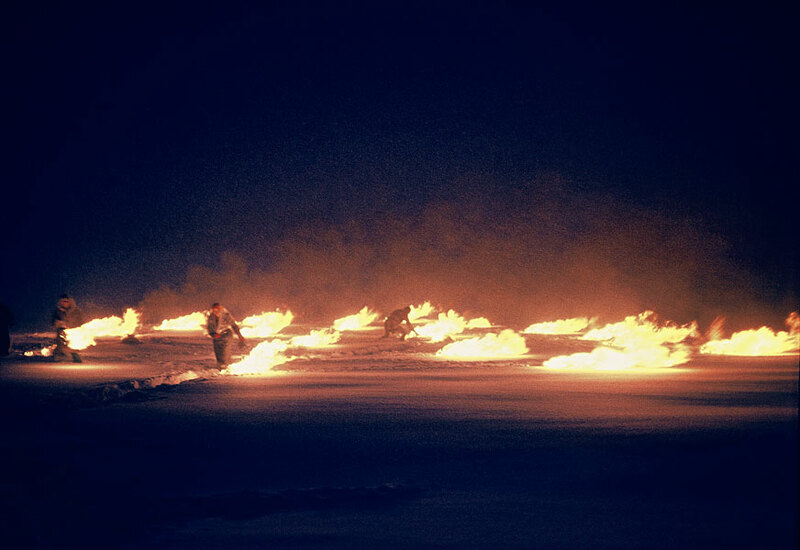 The bags were set on fire at nightfall. This event was held in memory of a shoe-maker from the town who was said to have protested the German occupation during World War II by walking in the surrounding hills while spitting fire. Two months later, for Laying Napkins near Sudomer, the artist laid out approximately 700 napkins to form a triangle in a grass field near Sudomer, the site of a famous Hussite battle in 1420. The action referred to local folklore relating how Hussite women would spread pieces of cloth on a marshy field to snag the spurs of the Roman Catholic cavalrymen as they dismounted, making them easy targets for the Hussite warriors. Zorka Saglova, Homage to Gustav Obermann, 1970, six gelatin-silver prints, 15 3/4 × 23 5/8 in. (40 × 60 cm) each, collection of Jan Sagl. 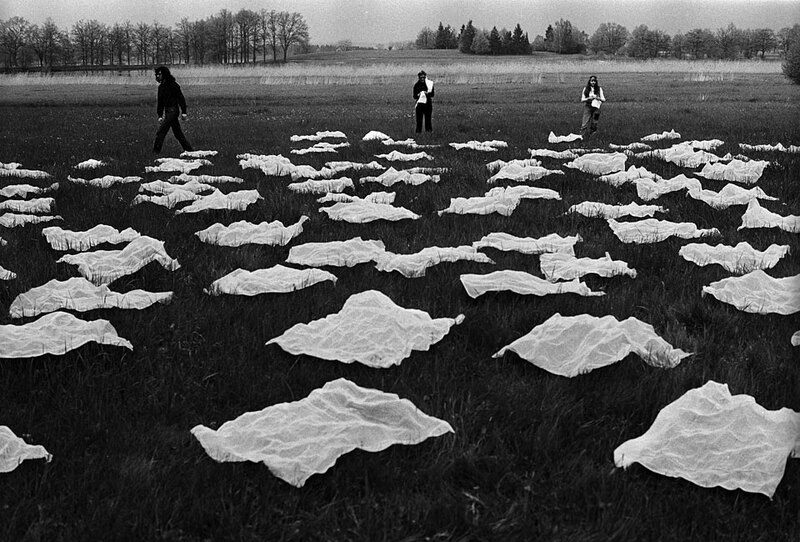 Zorka Saglova, Laying Napkins Near Sudomer, 1970, six gelatin-silver prints, 15 3/4 × 23 5/8 in. (40 × 60 cm) each, collection of Jan Sagl. This work was made for “Operazione Vesuvio,” organized by Pierre Restany, an exhibition which presented artists’ design proposals for a cultural park atop Mt. Vesuvius. 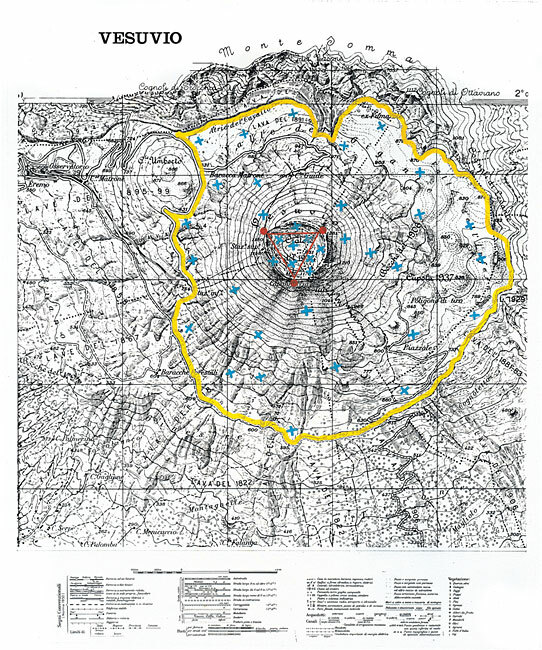 Sanejouand imagined a park requiring three stages of construction: first, paint a yellow line demar-cating its borders; second, drop large blocks of ice from a helicopter into the designated area; third, place microphones inside Vesuvius and install three listening stations at its rim to enable visitors to listen to the volcano. 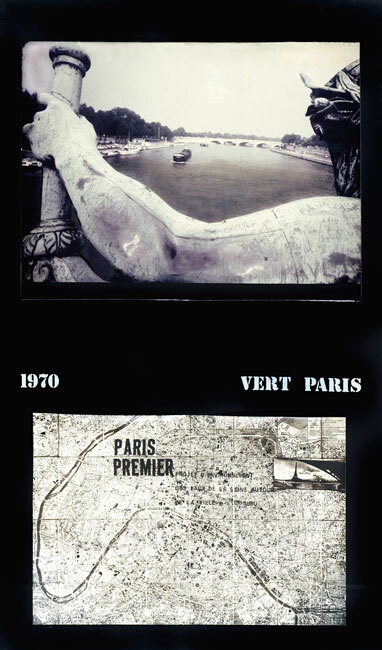 Jean-Michel Sanejouand, Projet D'organisation De L'espace de Cime Du Vésuve, 1972, laminated photograph mounted on Sintra, two panels: 133 7/16 × 86 5/8 in., (339 × 220 cm) overall, collection of the artist. 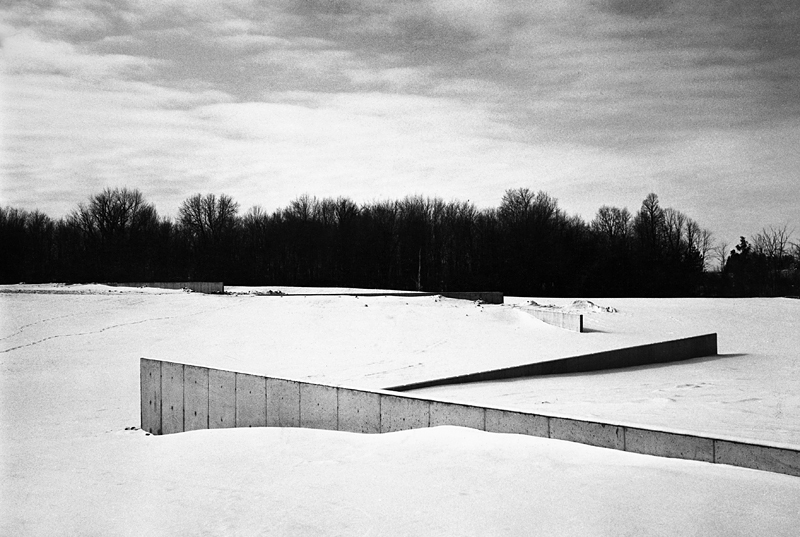 Richard Serra, Shift, 1970-1972, gelatin-silver print,14 × 20 in. (35.56 × 50.8 cm), courtesy of the artist. Birth is part of a series of three films known collectively as Mythologies, shot in a clay pit in Sayreville, New Jersey, used by the Sayre and Fisher Brick Company to collect materials for brickmaking. 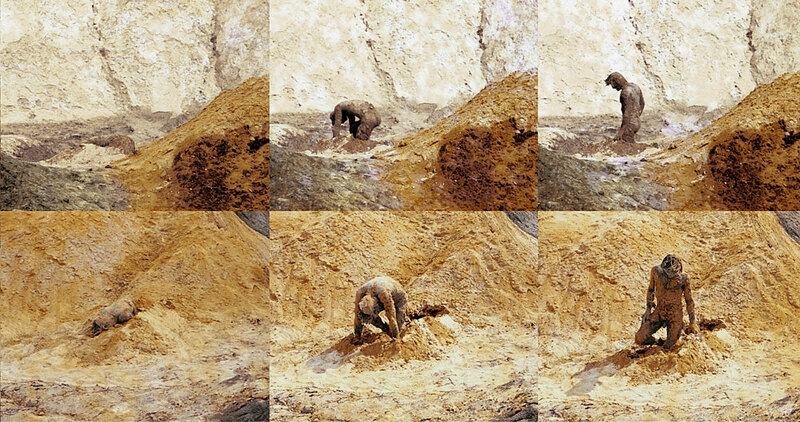 Recording actions performed in the pit by the artist annually over a number of years, they show Simonds’s physical engagement with the viscous, wet earth, which is at once primitive and sensual. Rather than positioning his body in the land, he makes himself of the land, emerging from it in the case of Birth as if he were a primordial being. Charles Simonds, Birth, 1970, 16mm film transferred to DVD; color and sound, 3 minutes, courtesy of the artist. In 1966 Ruscha, Blackwell, and Williams took a road trip to the desert outside of Los Angeles on Highway 91. Ruscha drove a 1963 Buick LeSabre, and when the car reached a peak speed of 90 miles per hour, Blackwell threw a Royal Typewriter out of the window. Blackwell’s photographs of the incident and the scattered wreckage evince a cold scientific style reminiscent of crime-scene photography. Edward Ruscha, Patrick Blackwell, and Mason Williams, Royal Road Test, 1967, fifty-three-page artist’s book, closed: 9 7/16 × 6 1/2 in. (24 × 16.5 cm), Research Library, The Getty Research Institute, Los Angeles. Spiral Jetty has three manifestations, each a discrete work in its own right. The most well known is the outdoor sculpture: a 1,500-foot-long spiral created with materials found on site at Rozel Point, Great Salt Lake, Utah. This work, which has at times been submerged under the lake’s waters, was originally sponsored by gallerist Virginia Dwan and acquired by Dia Art Foundation in 1999. Spiral Jetty also takes the form of an essay by the same name as well as a film funded by art dealer Douglas Chrismas. Smithson spoke of the sculpture in Utah as occupying a “site,” whereas he described the essay and the film as Nonsites. Smithson viewed language (the essay), photographic images (the film), and earth (the jetty) as material equals. 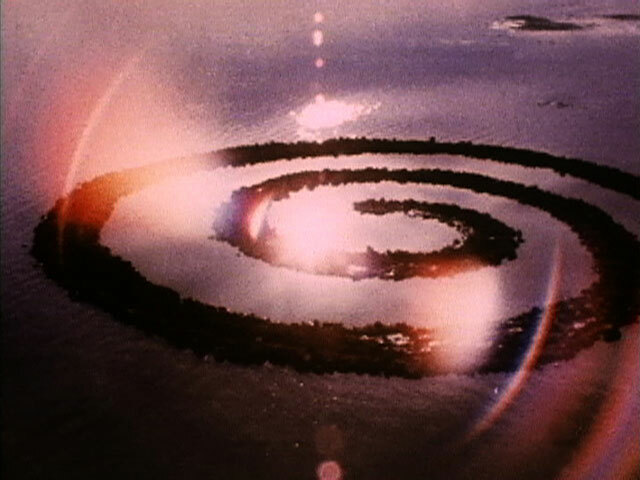 Robert Smithson, Spiral Jetty, 1970, 16mm film on video transferred to DVD; color and sound, 35 minutes, courtesy of Electronic Arts Intermix (EAI), New York. Smithson was approached in 1967 by the architecture firm Tippetts-Abbett-McCarthy-Stratton after one of their architects, Walther Prokosch, heard the artist speak at the Yale University School of Art and Architecture. In a 1972 interview Smithson recalled, “[the] architect ... asked me if I would participate in the building of the Dallas–Fort Worth [Regional] Airport, in terms of trying to figure out what an airport is. They would provide me with all the mapping material, and we had interesting discussions. I made models of possible airports. But I became less and less interested in the actual structure of the building and more interested in the processes of the building and all the different preliminary engineering things, like the boring of holes to take earth samples.... So I was interested in the preliminary aspects of building.” (Smithson, oral history interview conducted by Paul Cummings, July 14–19, 1972, Archives of American Art, Smithsonian Institution.) 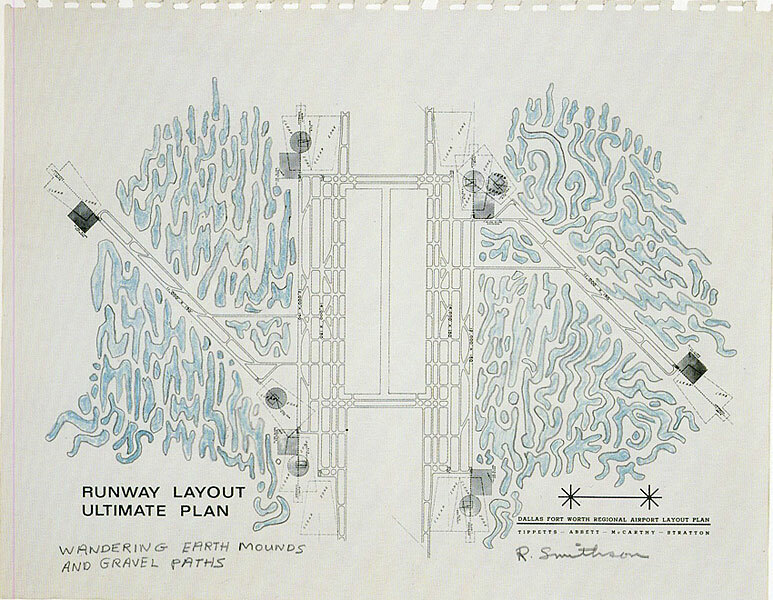 Smithson invited Carl Andre, Sol LeWitt, and Robert Morris to submit proposals for outdoor works, and he published two articles about the project, “Towards the Development of an Air Terminal Site” (1967) and “Aerial Art” (1969). None of the proposals were ever realized, but Smithson imagined a way to present them in a more conventional manner, as seen in his Airport Site Map. 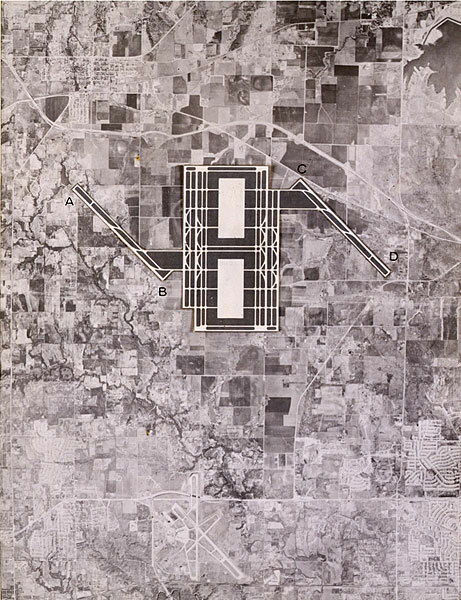 Robert Smithson, Dallas–Fort Worth Regional Airport Layout Plan: Wandering Earth Mounds and Gravel Paths, 1967, graphite and crayon on map, 26 1/16 × 30 3/4 in. 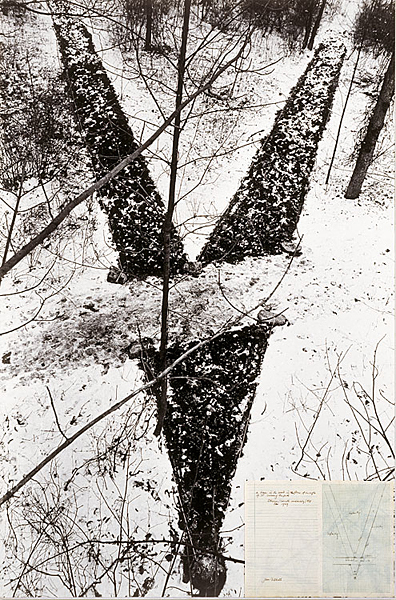 (66.2 × 78.11 cm), estate of Robert Smithson, James Cohan Gallery, New York. A collective of Italian neo-avant-garde architects founded in the context of the country’s postwar economic boom, Superstudio posed a radical counterforce to conventional Productivist under-standing of architecture. Their visionary proposal The Continuous Monument sees a gridded superstructure covering the surface of the planet, presaging contemporary techno systems such as the information highway and the globalized telecommunications network. The group’s plans took various forms, including magazine spreads and an unrealized film. 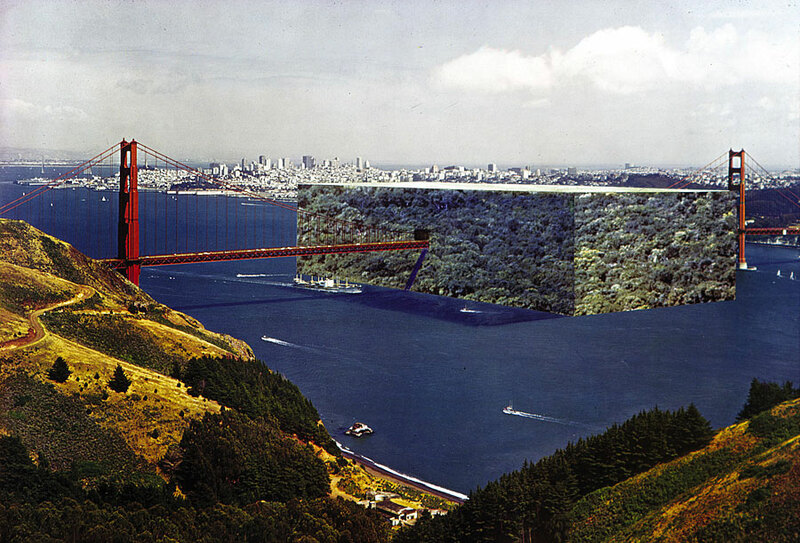 Superstudio, Cube of Forest on the Golden Gate, 1970-71, collage with photogravure and alterations in crayon, 29 1/2 × 42 5/16 in. (75 × 107.5 cm), collection of the heirs of Roberto Magris. Following the presentation of Tinguely’s self-destructing sculpture Hommage à New York at the Museum of Modern Art, New York, in 1960, the National Broadcasting Company (NBC) commissioned the Swiss artist to create a work for the weekly television news program David Brinkley’s Journal. In March 1962 the artist went to Nevada with the NBC film crew and fellow artist Niki de Saint-Phalle to realize a large-scale kinetic sculpture made out of junk found in scrap yards in and around Las Vegas. 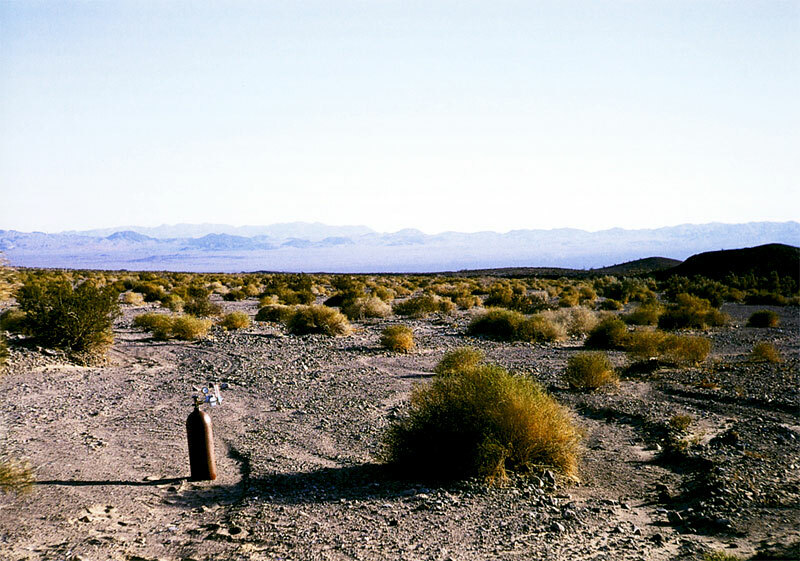 In the end, the sculpture was used in choreographed explosions at Jean Dry Lake, twenty miles southwest of Las Vegas and near an atomic test site. It is worth noting that Tinguley’s not-quite “end of the world” extravaganza was telecast on the same episode of David Brinkley’s Journal as was a major story on the nuclear arms talks happening that very same week involving leaders from around the world. Jean Tinguely, Study For An End of the World, No. 2, 1962, aired on David Brinkley’s Journal, 21:57 minutes, NBC Universal Archives. This is one of two actions that Ukeles performed at the Israel Museum at the invitation of curator Yona Fischer. Inspired by her brother’s permanent move from the United States to Israel, the artist buried two glass jars, one containing earth from Denver, Colorado (her birthplace), and another from New York City (her current residence) in an area between the museum’s sculpture garden and its Shrine of the Book. The earth that was displaced to make room for the jars was taken by Ukeles, to be held as “ransom” until her return to Israel either in life, as a settler (at which time the earth would be returned to its place), or in death (at which time it would be placed in her coffin according to Jewish tradition). Ukeles is still in possession of the Israeli earth. Mierle Laderman Ukeles, Maintain Your Destiny: Earth Exchange: Ransom Piece. February 19, 1974, 1974, nine gelatin-silver prints and two pages of text, eight prints: 16 × 20 in. (40.64 × 50.8 cm) each; one print: 20 × 16 in. (50.8 × 40.64 cm), courtesy of the artist and Ronald Feldman Fine Arts, New York. In October 1972 two pits were dug, one on each side of the Palestinian-Israeli border, and earth from each pit was transplanted into the other. Each pit measured 31 ½ inches deep by 31 ½ inches wide. Ullman worked with young residents from Kibbutz Metzer and the Arab village of Messer, the two settlements involved in the earth exchange. Micha Ullman, Messer-Metzer, 1972, eight gelatin-silver prints on cardboard, 31 7/8 × 43 11/16 in. (81 × 111 cm) each, courtesy of the artist. This series of works was part of Uriburu's “International Color Campaign” to dye bodies of water around the world, including the Grand Canal in Venice, the Port of Nice, and the Port of Antwerp. The spectacular nature of the project was conceived to draw attention to pressing environmental concerns of the 1970s. 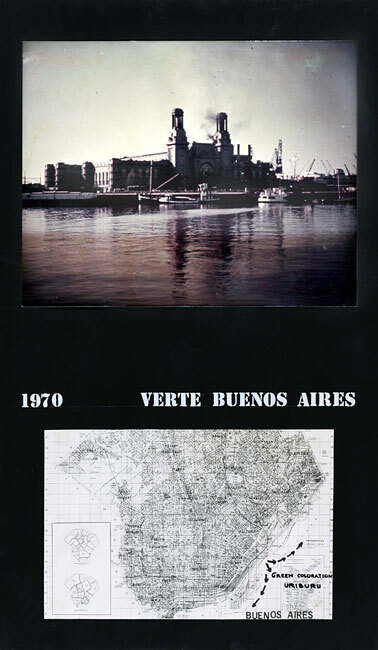 Nicolás García Uriburu, Verte Buenos Aires (Green Buenos Aires), 1970, color photograph and map, 39 3/4 × 23 13/16 in. (101 × 60.5 cm), El Museo de Arte Moderno de Buenos Aires. 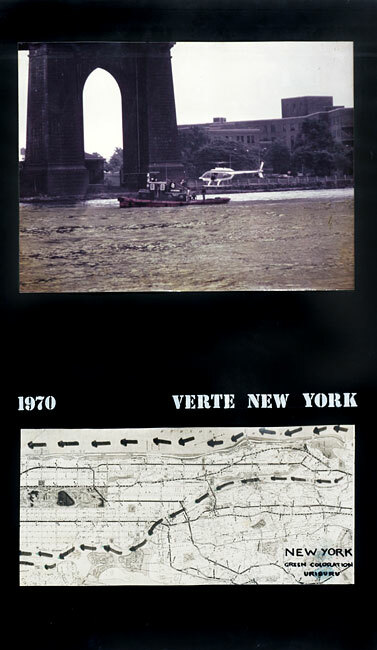 Nicolás García Uriburu, Verte New York, 1970, color photograph and map, 39 3/4 × 23 13/16 in. (101 × 60.5 cm),El Museo de Arte Moderno de Buenos Aires. Nicolás García Uriburu, Verte Páris, 1970, color photograph and map, 39 3/4 × 23 13/16 in. (101 × 60.5 cm),El Museo de Arte Moderno de Buenos Aires. 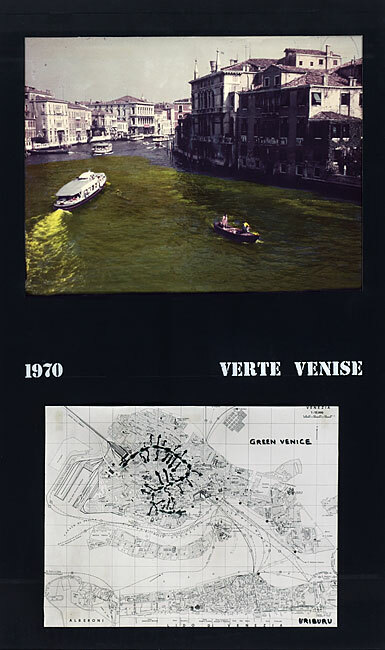 Nicolás García Uriburu, Verte Venise, 1970, color photograph and map, 39 3/4 × 23 13/16 in. (101 × 60.5 cm), El Museo de Arte Moderno de Buenos Aires. Developed by MOCA for Ends of the Earth: Land Art to 1974, and republished in 2016 as an art project by greg.org, this interactive feature maps key artworks included in the exhibition, pinpointing their original locations to demonstrate the global nature of Land art and its relationship to real places and times. Click on an artist’s name to begin. 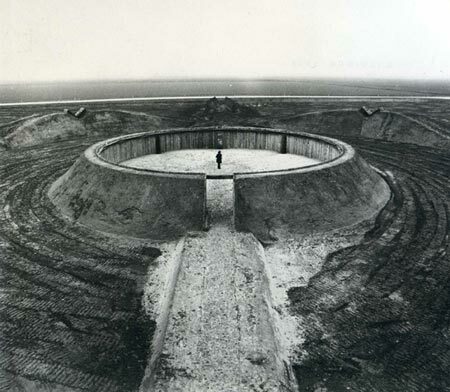 Ends of the Earth: Land Art to 1974 is the first large-scale, historical-thematic exhibition to deal broadly with Land art, capturing the simultaneous impulse emergent in the 1960s to use the earth as an artistic medium and to locate works in remote sites far from familiar art contexts. Organized by MOCA Senior Curator Philipp Kaiser and co-curator Miwon Kwon, Professor of Art History at UCLA, the exhibition highlights the early years of untested artistic experimentations and concludes in the mid-1970s before Land art becomes a fully institutionalized category. Rather than romanticizing notions of "return to nature" or an "escape from culture", the exhibition provides a comprehensive overview that reveals the complexity of the movement's social and political engagement with the historical conditions of its time. Ends of the Earth exposes Land art as a media practice as much as a sculptural one, focusing on the extent to which language, photography, film, and television served as an integral and not a secondary or supplementary part of its formation. Over eighty artists and projects from United Kingdom, Japan, Israel, Iceland, Eastern and Northern Europe, as well as North and South Americas are included in the show. 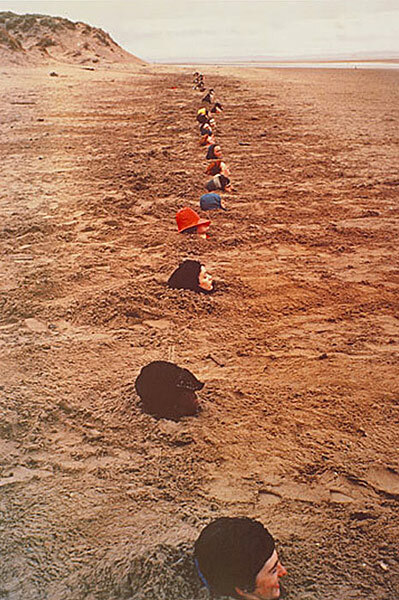 Ends of the Earth: Land Art to 1974 is organized by The Museum of Contemporary Art, Los Angeles, in collaboration with Haus der Kunst, Munich. Major support is provided by Barbara Kruger and L&M Arts, LA. The exhibition is also made possible by Kathi and Gary Cypres. Generous support is provided by Suzanne and David Johnson. Additional support is provided by The Kwon Family Foundation and John Morace and Tom Kennedy. WEBSITE CREDITS:Concept and direction by Bret Nicely. Editorial contributions by Elizabeth Hamilton and Lily Siegel. Site design and developement by OKFocus, produced by Ways & Means. Special thanks to Google Earth for guidance during the development of this project. This site was republished as an art project on greg.org after Kimberly Drew (@museummammy) noted its deletion from MOCA.